On one hand, I like air travel. I feel securely in my element when I am walking through an airport, earbuds firmly in ears, bag swinging slightly at my side, bottle of water in my hand. There is a crowded isolationism inherent to airport and airplane culture, and in that culture, I excel. My earbuds aren’t rude; they’re expected. I doubt anyone even really notices them. I know I don’t notice anyone else’s. There is no appropriate emotion for air travel. If I see someone crying on an airplane, I assume they also made the mistake of watching The Fosters on their iPad, but their tears could have any number of other causes. No one wonders why you’re alone at an airport. I prefer to travel with a companion (aka someone to watch your bag while you use the bathroom), but as with every other aspect of life, I don’t mind being alone in an airport. I like the design of airports. There are few places where layout is more important, and there is somewhere to buy a latte every three feet (unless you’re in the Shreveport airport). I like being forced to eat badly and drink alcohol at ten in the morning and coffee at ten at night. Time and money are just arbitrary numbers at the airport. I don’t mind a long layover because of the aforementioned food and beverage situation. I possess the ideal temperament for air travel. I always want to be the sort of person who goes with the flow, and I only truly achieve it when I’m traveling alone so I’ll never have any witnesses. I am also clean and polite, the two most important things in an airplane passenger. I try not to be pushy. I am rarely in a hurry and this attitude extends to air travel. If I can sleep, it is just a doze, so I’m never that person with legs splayed out, head leaned forward, snoring away as if they are not on a floating bus of strangers suspended 30,000 feet above the ground. I’m not a physicist (in fact, I typed psychic like three times before I remembered how to make physics into a person). If I were, would the magic of airplanes bother me more or less? Sometimes, one can know too much. Maybe if I had flown more when I was younger, I wouldn’t feel so cautious and distrustful about the physics. My first airplane trip was a transatlantic one when I was seventeen. After that, I flew intermittently until I moved to California. The United States of America is too damn wide, and I’ve resigned myself to a new, air traveler lifestyle. It beats the alternative, which is a three-day car trip. I like to drive, but c’mon. The 30,000 feet is also where I start to get physically uncomfortable. Flying coach is a small person’s game. I am only 5’7”, but that’s mostly legs. When I’m sitting in that narrow seat, with its narrow spaces between people and its nearness to the backs of the other seats, I feel wedged in. In order to shift my legs, I sometimes have to almost stand up. Of course, no one really “stands up” on an airplane, except maybe a hobbit. The whole business—from boarding to deplaning—is a hunched affair. 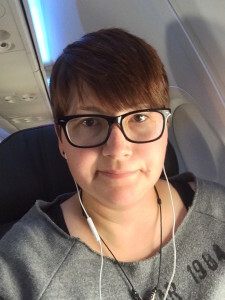 When I’m flying to or from San Francisco, I usually have a connecting flight in Chicago or Detroit. It takes about 4.5 hours to fly between ORD and SFO and about six hours between DTW and SFO. Six hours is too many hours on an airplane. I know my first flight ever was eight hours, but that was a long time ago. It was pre-9/11, even. I can’t fathom how I managed it with only my Discman and my journal. Now I require an iPad stocked full of TV shows and books, a paper book (just in case), and also Sudafed (because the changes in altitude screw with my sinuses). These crutches aren’t to stave off boredom; they’re more to keep the crazy at bay. My legs aren’t the only part of my being that starts to go crazy at 30,000 feet. My brain also tends to become a little loose on its hinges. If ever I have a full-on panic attack, an epic temper tantrum, or a Network-style breakdown, it will be at 30,000 feet. Usually, during takeoff and landing, I listen to this Indigo Girls song called “Airplane.” Emily wrote it as an ode to anxiety about flying, and let’s just say it’s not my favorite song of hers. I never listen to it except in the two circumstances I just mentioned. The first time I did it as kind of a joke, and now I do it every time as a sort of ritual. The thing about earning my loyalty is that once you’ve got it, I will make even your crappy songs part of my rituals. No matter how long the flight is, though, it always feels like I’m suddenly in a new place, like time is a wily shape-shifter, and even though I was on an airplane for 97 hours, only a few Earth hours have passed. It is still the same day, and it doesn’t matter what time it is. It’s time for a cocktail.